A study of life and extinctions among woolly mammoths and other ice-age animals suggests that interconnected habitats can help Arctic mammal species survive environmental changes. The study went online Nov. 2 in the Proceedings of the National Academy of Sciences "Early Edition." Short periods of warm climate in the midst of the last ice age triggered boom-and-bust cycles in the populations of large mammals in the Arctic, the researchers found. Many large mammals became extinct when these cycles and the ice age ended and spreading peatlands and rising sea levels restricted animals' ability to move between continents. Daniel Mann, associate professor of Geosciences at the University of Alaska Fairbanks, holds the upper part of a skull belonging to a young stallion that roamed the North Slope about 22,000 years ago during the last ice age. Mann found the skull eroding from a river bluff. Interestingly, most ice-age horse skulls found on the North Slope belong to young stallions. Credit: Photo by Pamela Groves, University of Alaska Fairbanks. 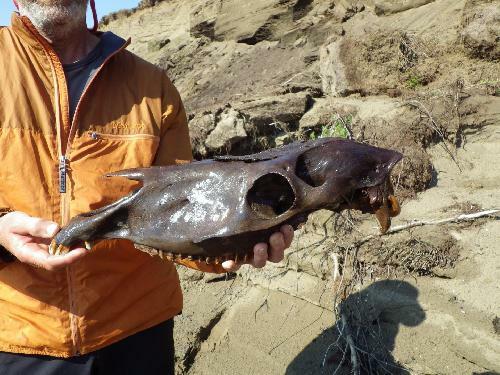 Scientists from the University of Alaska Fairbanks and the University of California examined the age and abundance of the bones of megafauna, a term for mammals weighing more than 100 pounds, on Alaska's North Slope, a tundra region between the Brooks Range and the Arctic Ocean. By radiocarbon dating the fossils and comparing their ages and abundances to climate records spanning the past 40,000 years, the researchers reconstructed a picture of what happened woolly mammoths, steppe bison and other mammals in Alaska's Arctic. "We wanted to know how these large animals responded to the rapid climatic changes that characterized that period of Earth's history," said lead author Daniel Mann, an associate professor in the UAF Department of Geosciences. "To do this, we tested a hypothesis suggested by (retired) UAF paleontologist Dale Guthrie that megafaunal populations experienced boom-and-bust cycles during the ice age as the vegetation tracked climate change." The last ice age, about 80,000 to 12,000 years ago, was a time of diverse climates, said Mann. The results of this 20-year study show that animal and plant communities were much more changeable during the ice age than they have been during the last 12,000 years of interglacial climate in which we live today. "This has been a long-term effort, and it has resulted in a much larger data set of bones from one given area than anybody else has ever compiled," said co-author Pamela Groves, a wildlife biologist at the UAF Institute of Arctic Biology. During the last ice age, lowered sea level drained the Bering Strait, the narrow seaway now separating Alaska and Asia. Being able to move back and forth across Bering Strait is probably what kept the large Arctic mammals thriving for so long, Mann said. This travel corridor allowed mammals to come to Alaska when their favored foods -- grasses, sedges, and rushes -- thrived during warm periods. The strait also allowed mammals to leave Alaska for greener pastures when prolonged periods of warmer, wetter climate allowed peat to spread, which cooled the ground and discouraged the grass, sedges and rushes from growing. "Counterintuitively, rapid climate changes during the ice age were, at times, highly beneficial for megafauna when rapid warming allowed grasses and forbs to briefly spread before peatlands had a chance to take over the landscape and degrade forage quality," said Groves. When the planet's big ice sheets collapsed at the end of the last ice age, their melting caused global sea levels to rise as much as 100 meters in roughly 10,000 years, which is fast in geological time, Mann noted. "In the case of northern Alaska, the rising seas flooded the Bering Strait, which changed the climate of the North Slope," Mann said. "Summers became wetter and cooler because the sea was much closer. This encouraged the spread of organic soils and peat at the same time that it cut off access between Asia and Alaska." The animals couldn't migrate elsewhere because ice sheets were still blocking their way to the east. "We've known for some time that the population sizes of these animals fluctuated throughout the last ice age," said evolutionary biologist Beth Shapiro of the University of California Santa Cruz, who was also a part of this study. "What this study provides is a possible explanation for these changes." Mann became interested in the study when he and other researchers went to archaeological sites on the North Slope in 1994 to see what ice-age humans were eating. He said they didn't find much evidence of humans on the North Slope, which suggested they weren't a driving factor in the mass extinction of the large mammals. The researchers did find more than 4,000 bones of ancient ice-age animals during the last two decades. The bones are now archived in the University of Alaska Museum of the North. It took two decades to collect enough bones for the study and then several more years to figure out the statistical methods needed to analyze the radiocarbon data, Mann said. "One of the contributions of research like this is helping humans understand the challenges large animals face today from climate change," Groves said. "It's a testimony to the value of doing long-term research." The study's conclusions have implications for present day extinctions. "As human populations grow, patches of suitable habitat for many species are becoming increasingly isolated from each other," said Shapiro. "If we are to preserve these species, we will need to devise strategies that allow these populations to remain somehow connected." The project was supported by the National Science Foundation and the U.S. Bureau of Land Management. "Arctic climates are particularly unstable and are changing rapidly today," Mann said, "This means the Arctic is an interesting place to study how climate changes cause extinctions, and the past gives us many interesting examples of extinction there. Plus, bones are exceptionally well-preserved because of the frozen ground."